28th December, 2009 was Avenged Sevenfold’s darkest day. The death of their beloved best friend and drummer Jimmy Owen Sullivan (better known by his stage name, The Rev) brought to them an overwhelming loss, a hole that can never truly be filled. The fact that Avenged Sevenfold were only weeks away from commencing the recording of this very album only brings more weight to the tragic events that have led up to Nightmare – a fantastic tour de force of metallic riffage, seething emotion and without a doubt the rawest lyrics this band have ever put to paper. It seems almost wrong to be talking about an album so cloaked in sadness in any celebratory fashion, so let’s just get down to business: the songs. Beginning our journey is, of course, the title track and lead single. Upon hearing the rest of this album, you realise that this is not just the only song A7X could’ve chosen to open this, their magnum opus, but it is the quintessential opening track of their entire career. Built on spine tingling dynamics and the expected twist and turns that any Avenged number brings, the band quickly settle into a fantastically heavy groove and subsequently take you on a rollercoaster of changes in mood and pace. 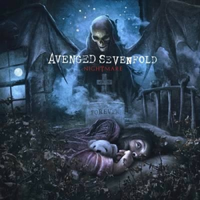 M Shadows’ ever distinctive growl gives way to a chorus the size of continents, and in a matter of 6 and a half minutes, ‘Nightmare’ becomes the call to arms for the rest of the album. You are called to join them on their expansive journey, but brace yourself: not everything is as it would seem. Read on. What Avenged Sevenfold have done here is really quite baffling in some regards. How is it that an album can be so exciting when it’s shrouded in tragedy? It’s simple. Jimmy’s death has brought an insurmountable amount of soul to their performances. You can feel the overpowering sense of loss in every note and every melody. This isn’t a by the numbers effort; every last member of this band bleeds themselves into the music and the end result is nothing short of stunning. This isn’t their Master Of Puppets, this is their The Dark Knight. The fact that Avenged Sevenfold have even found it within themselves to complete this record deserves an endless amount of respect. It is a true testament to the human spirit. You will feel genuinely speechless upon first listen, fan or otherwise – the heartbreak shared by a family mourning their loss is just too evident to ignore. There is no possible way you can’t be affected by this. This isn’t a record. This is art.